I hope that until the end of days, good hearted friends who take a look at what I have made, when they will perceive the seriousness and the spirit of my effort, can have a fair view and can invoke my name to pray for me. When I was a child, I remember visiting my grandmother and running my small hands across her collection of bottle openers that hung from a string across the kitchen window. There was one opener in particular that I liked, a bronze enamel one in the shape of an urn with colorful flowers, and she told me that she brought that back from Turkey decades ago. That little tchotchke was my first introduction to the country of Turkey and since then, I always imagined it be an exotic place very different from the westernized world I was familiar with, a faraway place of spice markets and domed buildings and olive-skinned men wearing turbans while riding camels in the blazing sun. I may have been a smidge off on the last part, but my recent visit to Turkey proved to my childhood self that it indeed is the exotic, flavorful place I imagined it to be. The country is full of ancient history, beautiful ruins, unique experiences, amazing nature, and more. As a solo female traveler, Turkey was a big cultural change for me and I don't mean that in a necessarily good way, but I'll get into that in future posts. For now, here are some photos from Istanbul, the country's cultural capital (Ankara is the actual capital) and my first stop on my trip to Turkey. To me, the best thing about winter is that it is followed by spring. And spring in Turkey is pretty darn delightful, because it’s when Istanbul holds its annual international tulip festival, the countryside changes from brown to green, and flowers of all types dot the landscape. 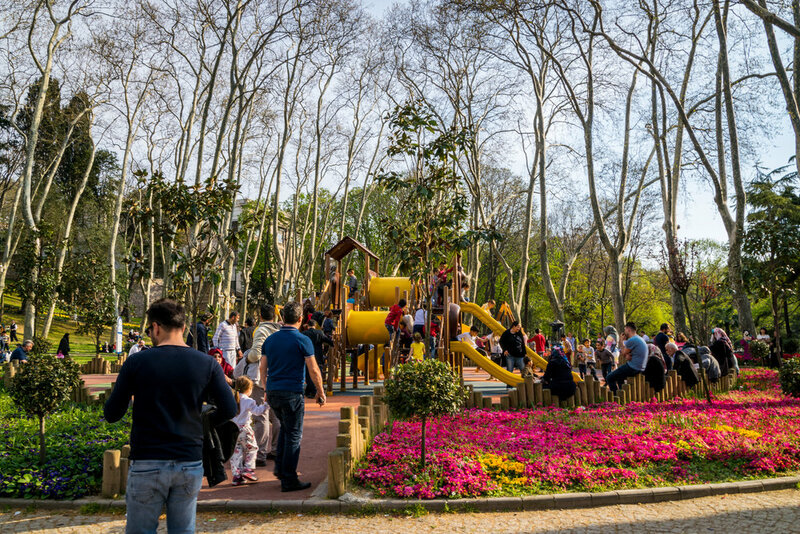 In Istanbul, I don’t know what the city’s landscaping budget is but I assume it’s astronomical, because every park I visited and median or roundabout I passed featured bright flowers planted in whimsical patterns that never failed to take my breath away. According to the official website of Istanbul, the Ottoman Empire (not the Dutch) began the cultivation of tulips and the flower has been a symbol of Istanbul throughout time. The wealthiest period of the Ottoman Empire is actually called the Tulip Era, or Lale Devri. Since April 2006, the city of Istanbul has held its Lale Festivali and plants millions of tulips all over the city. This year, more than 14.4 million tulips of 270 varieties were planted, and live music and other cultural activities accompanied their natural beauty. The flowers in the parks by the Blue Mosque/Hagia Sophia and Topkapi Palace (Gülhane Parkı Çeşmesi) were especially beautiful and the ones posted here. After dealing with some stressful matters, I treated myself to a relaxing Turkish bath. Wow, what an amazing experience! There are Turkish baths all over the city and I read various reviews online before selecting the highest rated and most luxurious one: Ayasofya Hürrem Sultan Hamamı (because if I’m going to do it, I better do it right, and my next stop is Thailand where cheap massages will balance things out hehe). I chose the ‘KEYF-İ HAMAM’ bath package and for about $100, I was treated to an hour of body scrubbing, bubble washing, and aromatherapy massaging. It was heaven, and my attendant made me so relaxed that I forgot to be modest about wearing just a disposable thong in a room full of women. Between the bath and massage, I was treated to a cold glass of fresh, traditional fruit sherbet and some Turkish delight (a tiny portion, consider the appetite I had worked up being scrubbed so thoroughly). My favorite part of the experience was the building, though, and famous chief Ottoman architect Mimar Sinan designed and built the grand bath in the 1550s. In the 1900s, it was abandoned then renovated as a carpet bazaar, and finally restored to its original glory as a Turkish bath in 2007. It is conveniently located between the Blue Mosque and Hagia Sophia and its opulent marble interior and dark wood levels make it feel both luxurious and inviting, the perfect treat for wary travelers such as myself. Visiting Istanbul’s bazaars is an amazing experience and one can find practically anything for sale there. Unique souvenirs? Check. Spices, teas, sweets, and dried fruits? Done. Adidas tennis shoes and Burberry bags? Got it, although there’s a 100% chance they are fake. 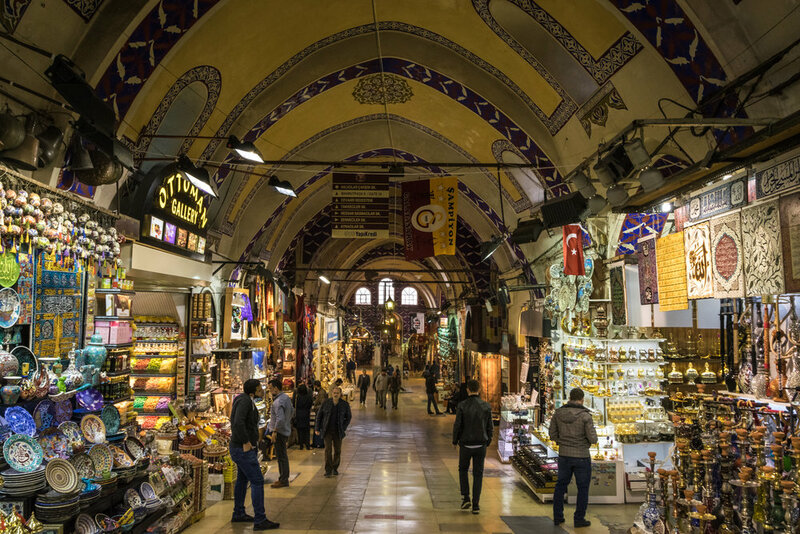 The Grand Bazaar is one of the oldest and largest covered markets in the world, and it’s packed with locals and tourists (hint: it’s a good idea to watch for pick pocketers). Personally, I don’t like shopping especially given my nomadic lifestyle, and haggling over prices is just not my thing, so I bought a used book and a zippered pouch and just wandered around. Built in the 1450s, the domed halls (bedestens) feature touristy shops with arched doorways and elaborately painted designs on the ceiling. But these two old buildings can’t contain the massive amounts of shops, and nearby alleyways are full of vendors selling clothing, electronics, and any other random thing you can think of. In Sultanamet, I enjoyed the smaller, less crowded, and more tourist-oriented Arasta Bazaar with its carefully curated selection of wool rugs, cotton towels, kilim shoes, and glass lamps. (I picked up some cute flats there, a welcome addition to the stale wardrobe I've been dragging around for nine months.) But wherever you go in Istanbul you’ll find someone selling something, from tissue packets (now I understand why) to safety cones to the chance to hop on a rusty scale, so it’s safe to say the entire city feels like a bazaar. Beneath an unassuming stone building near the Hagia Sophia is an ancient underworld leftover from the Byzantine era. Where the Basilica Cistern is now once stood a grand basilica built during the Early Roman Age in the 3rd and 4th centuries, a structure rebuilt to be a massive underground chamber to provide nearby palaces with filtered water in the 6th century. The underground cistern has 336 towering marble columns and two unusual Medusa column bases from Roman times, making it the perfect shoot location for the many action movies that appreciate such a dark, unique, and elegant setting. 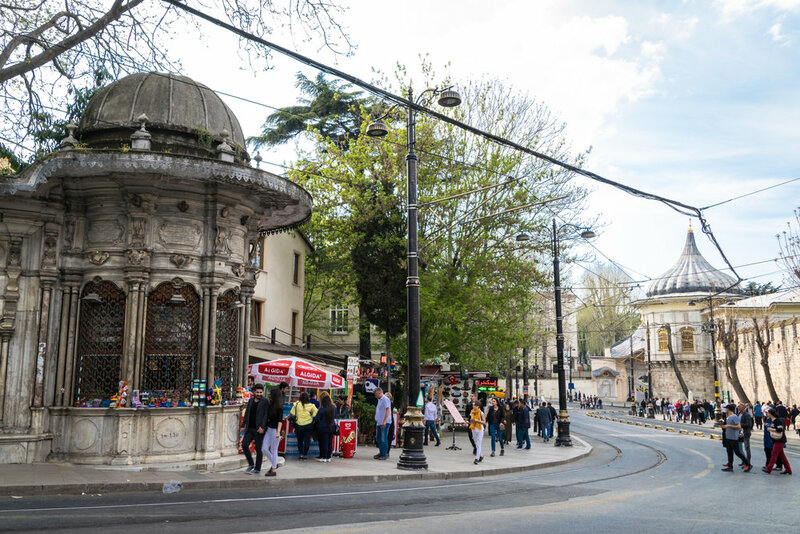 While most of Istanbul’s current building stock consists of dull concrete block buildings built in the past few decades, there is a healthy amount of historic buildings that dates back to ancient Greek and Roman times thousands of years ago. Imagine marble stone buildings with sensuously curving roofs and mosaic tile details, or elegant stone buildings that resemble castles with an eastern flare, or cozy, simple bay-windowed wooden houses in tidy rows. I was happy to see many historic buildings, especially mosques, undergoing serious renovations and some traditional Ottoman-style wooden houses had been reconstructed near the Hagia Sophia, although many wooden buildings in poorer parts of town have become woefully derelict over time (interesting article here).